Hitting the water for a day of fishing is a great way to get out of the house and spend some time in the outdoors. Whether you’re by yourself, with friends or family, this is a great way to get out and spend some time with yourself of with those closest to you. 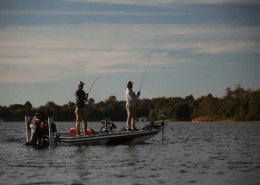 Getting out on the water and hooking a fish is only half the battle, you need to land them too. There are several ways of doing this, from simply lifting them into the boat to using your hands. These methods do work but we always recommend the use of a landing net. By using a landing net you greatly increase your chances of landing your catch time and time again. Simply get the fish next to the boat and scoop it up with the net and bring it into the boat. This is much safer than trying to hoist it in with your pole like its a crane and you don’t risk the chance that your line breaks under the stress, or even worse, your pole. Another thing to take into consideration is the type of fish you’ll be catching, if you’re going after larger fish you’ll want to make sure you use a net. 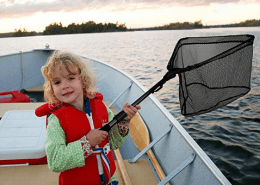 So whether you’re trying to find which landing net is the best or you’re just looking for a list of some of the top fishing landing nets currently on the market, you’ve come to the right place. Here are our picks for the best fishing landing nets for the money in 2019. 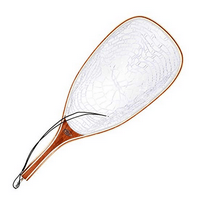 The SF Fly Fishing Landing Net is perfect for catch-and-release because the net is made of a soft, rubberized material that’s gentle on fish. This material also protects from tangling as well as rot and mildew. It has a clear color, which helps minimize the stress on fish because it’s pretty much invisible underwater. Although it’s best for catch-and-release fly fishing, its durable construction makes it suitable for use in most recreational fishing situations. The frame of this landing net is made of a combination of hardwood and bamboo. The entire unit is approximately 24.4 inches long, with the handle being a comfortable 8.3 inches long. The hoop is approximately 16 x 9.5 inches and the net is about 14.2 inches deep. Amidst all the excitement of landing your catch, it’s easy to accidentally drop your net and consequently lose it. This makes that situation virtually impossible because you can keep it secure using the quick-release magnetic clip that attaches to a copper swivel. It’s meant to be held together by the included heavy duty spring cord. 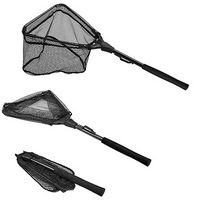 The PLUSINNO Fishing Net is a collapsible, hexagonal landing net that’s lightweight yet remarkably durable. Its solid construction is a combination of fiberglass, high-density carbon fiber, and EVA. 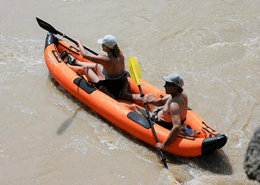 The EVA around the handle makes it not only comfortable to hold but also skid-resistant. The net of the PLUSINNO is made of a strong nylon. Because it’s non-absorbent, you don’t need to worry about bad odors, bacteria, mold, mildew and other typical problems caused by waterlogging. The premium nylon mesh is also knotless, making it a great option for catch-and-release. Additionally, that minimizes the risk of getting tangled with fishhooks, making it one of the best bass fishing net which goes perfect with your bass fishing rods. This PLUSINNO Landing Net has a fixed pole. In total, it weighs 10.5 ounces and measures 27.5 inches long. The hoop is 12 inches and the net is 7.5 inches deep. When collapsed, it takes up only 17 x 4 inches of space. Should you need something else, it also comes in other hoop sizes (16, 17, and 20 inches), some with telescoping poles which is similar to telescopic fishing rods. All models fold up for easy storage and transport. Although this landing net doesn’t float, it comes with a belt clip to keep it secure and handy until you need to use it. 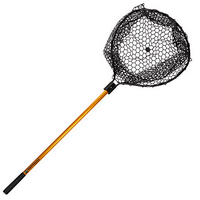 The Wakeman Classic Landing Net has a retractable handle that’s made of aluminum. When fully extended, it measures a total of 56 inches long. 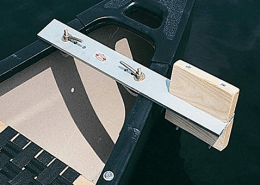 The handle is approximately 35 inches long and, because it collapses, it’s easier to store and take with you on your fishing adventures. However, it will still take up 35 inches of space when collapsed because it doesn’t fold making it a great boat fishing net due to its length. 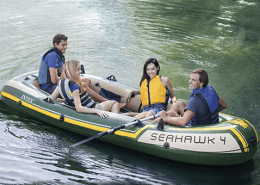 The net of the Wakeman Classic is 20 inches long, 19 inches wide, and 17 inches deep. 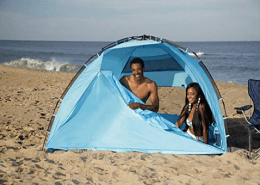 It is made of a premium rubber-thermal plastic that’s not only durable but also minimizes the risk of tangles and hook snags. The shape is designed to have a flat bottom, making it not only suitable for but also gentle on fish of all sizes. That means it’s also great for catch-and-release. The Wakeman Classic Landing Net floats in water so you don’t need to worry too much about losing it. 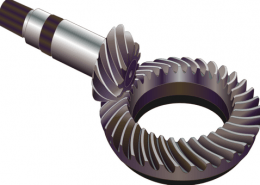 Additionally, it is remarkably balanced and offers a nice, comfortable grip. It’s pretty versatile so you can use it to land anything from minnows to 12-pound bass, northern pike, and possibly even 30-pound catfish with ease making it one of the top fishing landing nets. The South Bend LN-250 is a landing net that has a teardrop-shaped hoop made of durable but lightweight 1/2-inch aluminum. The handle is approximately 5.5 inches long and has a molded grip so it’s both comfortable and secure in your hand. 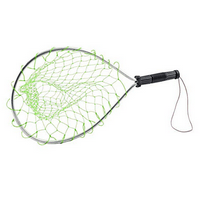 Although it doesn’t float, it has a bright green netting that makes it easy to find if you ever drop it in the water. It also has a 9-inch elastic wrist cord to keep that from happening. Its size also makes it compatible with standard rod holders. This landing net’s hoop is 15 inches long and 14 inches wide. The net is 24 inches deep, making it a good choice for small fish as well as for lunkers. It’s made of knotted poly netting so you know it’s tough but you need to be careful of snags. It may also be hard on delicate fish so it may not be a great option for catch-and-release. This makes for one of the best saltwater landing nets because of the material the net is made out of. 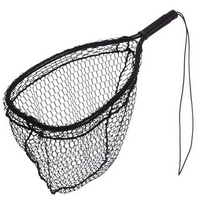 The Ed Cumings Black Fish Saver is a landing net that measures a total of 19.5 inches long. The handle is 5.5 inches long and has high quality grips to keep it secure in your hand, even when wet. 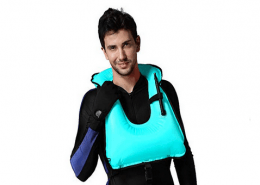 Although it doesn’t float, it comes with a heavy duty elastic cord so you can tie it to your fishing waders and stop worrying about losing it in the water. This landing net’s bow measures 14 x 11 inches. It is constructed with black anodized framing that’s 1/2-inch thick. 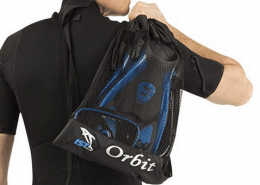 The mesh is black as well and is made of super soft nylon with 1/2-inch holes. It is approximately 12 inches deep and remarkably gentle on fish so it’s safe for catch-and-release and won’t harm even the most delicate gills. The mesh of the Ed Cumings Black Fish Saver Landing Net isn’t easily snagged and it’s generally safe for use with single hooks. However, as with most landing nets, cranks and jerks with 2 or more treble hooks might easily get caught in it.